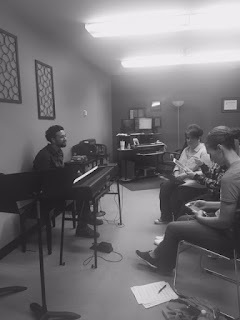 From the moment I saw Ernesto practicing with the vocalists, to the first notes I heard on stage at rehearsal this week, I knew we were in for something special! Ernesto Alcantara blessed us by guest worship leading this weekend and it lit up the house! He's a gifted communicator whose personal relationship with the Lord shines through everything he says and does. We enjoyed getting to know his wife Vanesa and daughter as well - it was amazing. Pastor Dave lead us into the discovery that we can and should be both deep and wide in our relationship with the Lord and others, as well as our ministry's focus. He left us with a challenge to each begin to pray that God will present us with an opportunity to lead another to Christ. Can you imagine how that would change our community? More than fancy programs, worrying about trivial things - just tell someone about your relationship with Jesus! So we can go deep spiritually as well as reaching out and with God's help - go wide into our community, into our jobs, wherever God places us - just reach out! You'll want to be with us again this week when special guest Les Parrott will teach our 3 weekend services! There is still time to register for the 2:00 Sunday FIGHT NIGHT event - but only a few seats left so hurry!! You can also use the above link to get to our website and register!